The goal of this project was to create a client-facing presentation within 3 days. Packing for a planned trip can be stressful, especially when the weather forecast changes at the last minute, leaving you underprepared. If the weather at your destination differs markedly from your current destination, it can be tough to mentally bridge the gap, and unless you’re really organized, you might forget things that are outside of your normal routine. As a result, you may not take enough of the right kind of clothing, and end up having to hurriedly buy something less than ideal once you arrive. 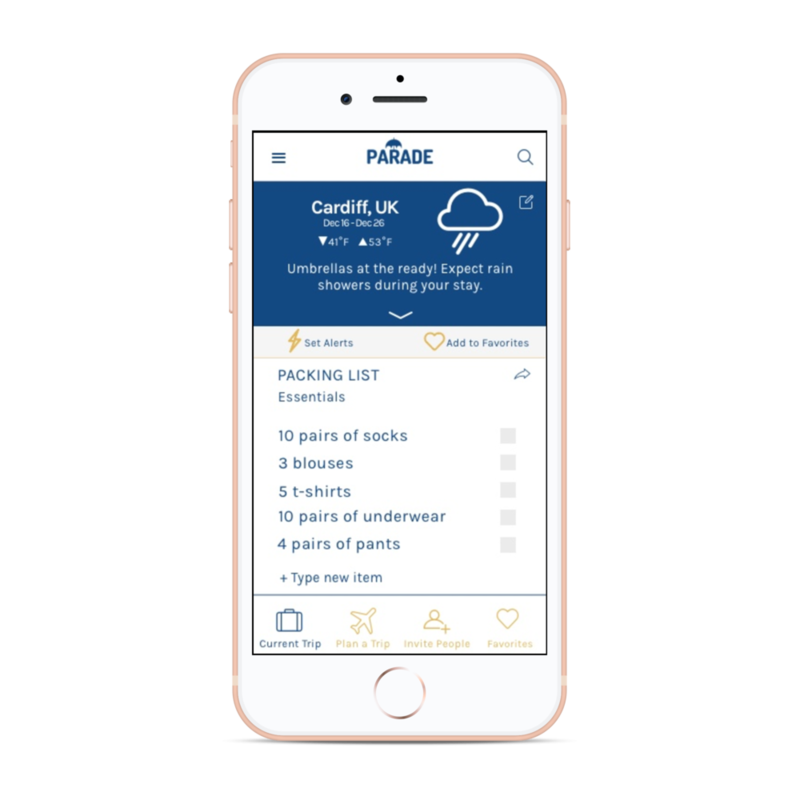 Parade, a mobile app for iOS and Android, watches the weather for you, alerts you to any predicted changes, and suggests how your packing list should reflect them. It brings together the most accurate and reliable weather data with smart, simple inventory-creation technology. I had only a few short days to complete this project, which I began with a topic map from which I created user interview questions and a script. The research phase had to be really condensed so I wasn’t able to interview enough people to get to the “point of least surprise”, but I did collect enough anecdotal information to be able to build a persona around. I focused on someone who is a keen organizer and relatively frequent traveler but who is currently missing out on the information she needs to feel confident in her preparations. I completed a competitive analysis of both packing and weather apps in order to inform a product sitting on the intersection between the two. 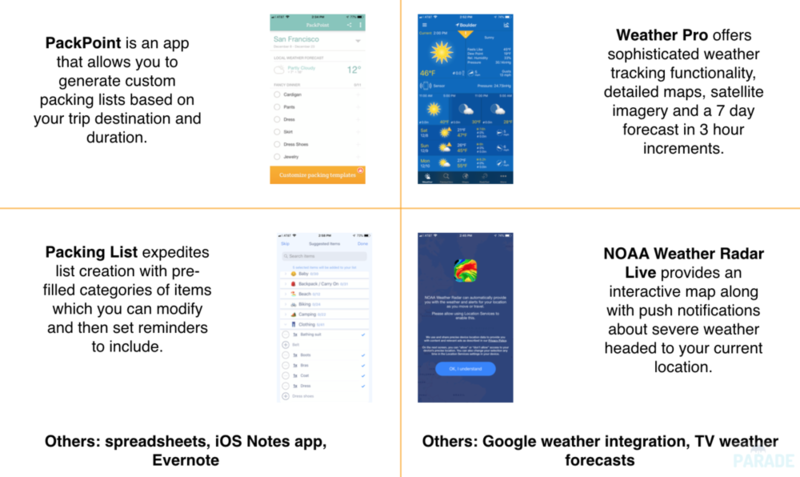 There is a plethora of weather forecasting apps for different purposes — I wanted Parade’s to be “smarter” by using multiple data sources and algorithmically determining which was most reliable. I also wanted to build in packing list recommendations that would grow more customized with use. Then I moved into storyboarding, sketching, and ideation, generating a features list which I grouped into “must have” and “nice-to-have,” basing my decisions around the red routes Laura would follow in order to achieve her core goals. These became the product roadmap. I need to explain why notifications are important to this app. Will that sway the user into enabling them? Should I redesign the initial flow so that the user enters the app before creating a trip, so they can feel a connection to it before we ask them to do a lot of work? If so, what would they see on that first screen? Should the weather forecast synopsis try to cover the whole trip period rather than the first day? Is it clear that that’s what it’s doing? What is the Favorites list actually for? Favorite trips? Favorite packing lists? If so, how does the user add them to that list? Invite Friends is important for network effects, but does it deserve to be on the bottom nav bar? Does the packing list need to separate out items that the app itself is recommending? How many parameters should be customizable in the Trip Alerts screen? The alerts cadence? More weather fluctuations? Is Start New Trip too hidden in the hamburger menu? Should there even be a Hamburger menu? Testing the prototypes revealed that users hated the profile page and were confused as to why I had included a Home icon. Views on notifications differed according to the participant’s age. They also wanted more customization in the alerts. And they didn’t understand why I was asking about laundry! Based on this feedback, I streamlined the onboarding flow, renamed the nav, and made trip alerts more detailed. I then began an iterative wireframing process, moving from a basic monochrome layout to a high fidelity UI. The final wireframes incorporated high resolution images and aesthetic considerations such as typeface (Karla, a Tamil-inspired typeface with a big personality that speaks to globalization) and color palette (blue and gold, indicating trustworthiness, and the colors of sea and sand, denoting exotic travel).